Till now a lot of people do not understand what i am doing as a job ..... and why :) Let me start with this story to explain how it all started. When i was about 6, i got my first little silver portable radio for my birthday, giving to me by my mom and dad. For some years i was very attracted to technique and wires, more than anything else. Maybe it was because my father who was an electrician.... must be :) So this radio was my first audio equipment that i got. I was hooked on it.... listening illegal to the radio stations at night from underneath my blankets. The years after i got more and more 'old' audio stuff from family and friends. Sometimes when it was broke i disassembled the whole thing trying to repair it. Mostly without success but sometimes i achieved to let it roll again, like the old UHER Tape recorder from my grandmother. Exactly that piece of equipment would be a start for my career in Professional Audio Engineering. I started to make so called remixes of records by cutting my audiotape and tape them again on other parts, making so called tapeloops , dubbing the result to my old BASF cassette-deck. Sometime there was a 100 mtr of cut tape in my trashcan. I started to build a first little audio studio when i was 12 years old, Studio1. 2 Old turntables, 2 cassette decks, a very simple mixer and the UHER for cutting the mix to a nice result. Around that time my remix maestro stood up, Ben Liebrand. The guy made incredible nice remixes (and he still does) of an hour at the program "In The Mix" on Radio Veronica. I had to wait with my finger on the pause button of my cassette deck till 11 o'clock at night... that was the time the radio program started. Every friday night i was waiting like that... sometime without success, i fell asleep before the program started. The next morning i did not have the recording i wanted. That was a waste, because i could not listen to the new tricks of the maestro himself. I started first with the so called "Pause Button Mixes", but when i got the grips on the Uher it was just cutting tapes and making loops. Another great dutch radio program that time was "The Soul Show" on the TROS radio station with DJ Ferry Maat. Import 12 inches from the USA, special long versions, nice news with good interviews like with Earth Wind and Fire, SOS Band, 52nd Street and more. One part in the show was the "Bond van doorstarters". Here remixers did send their 10-15 minute remix to the Soul Show and maybe yours was transmitted. I send some of mine over the years and one of them was really transmitted OnAir. Wow, i was very proud and i knew i was on the right track. I also learned a lot from the DMC (Disco mix club) and "3 Maal Doordraai" on AVRO radio. But the most i stayed impressed by Ben Liebrand, he had this famous speaker "Know your buttons" in which he explains: It does not matter how much and how good your equipment is, the main thing must come from yourself. Meanwhile on the age of 16 i bought a.... 'computer'. First a Commodore VIC20, later the Commodore 64 and the Amiga 2000. My mother did not understand why i put so much time in these kind of equipment. She said one day "René do not spend so much time on this, you never can earn you money with it" I remember her this nowadays to tease her sometimes :) On school i was seriously years in front of my teachers in knowledge about programming and systems. In those early computer days i programmed at home on my Commodores and on school we had MS-DOS and the Apple II. The knowledge i got at that time really helps me out till today while programming on websites and smartphone apps. I started to use these computers in my remixes and music productions. Next to that i had invested in a drum-computer (Yamaha RX11) a Synthesizer (Korg Poly 800) and a little mono sampler to add sounds from my records into my computer. I connected all the equipment by a MIDI (Musical Instrumental Digital Interface). I could now work on a production, sync my samples, synth and drums with a remix. The sequencing software on the Amiga 2000 i started with was called Music-X and was the centre of the setup. It was amazing what i could achieve with it. Over the years i sold some equipment and bought more professional stuff. The Korg Poly 800 i keep on using as master keyboard. Besides that i bought a Roland D110 synth module, an EMU SP12 Drum sampler and an AKAI S950 sampler. My computer was still an Amiga. An Amiga 3000 with inside that little box an AD516 Multrack Harddisk recorder from Sunrize and an EMU Proteus 1 Synth card. it was a huge investment that time. A had a so called Tripple play MIDI interface with 48 MIDI channels , the EMU synth added 16 extra channels so i had a total of 64 MIDI channels. That setup just rocked. I could even sync my 8 track harddisk recorder software with my Bars & Pipes MIDI sequencing software. That was a very strong music production centre for that time. I did a lot of audio productions with that setup and the biggest was a sound-design project for a 45 minute cartoon. I had to sync a video to my audio production setup. No money for a Betacam player ofcourse, so i did a trick. I recorded the whole cartoon to a VHS tape, on the right audio track i added smtp timecode. I connected the audio-out of that VHS to the SMTPE input on the Sunrize AD516..... when i played the video my Studio16 and BarsΠpes also played in sync. It was easy to add audio fx on the spot that i wanted, it worked pretty precise. By some luck i found myself at that time a job as Audio-Engineer for ENG TV work. The first week i even did not know exactly what to do, i played with the camera ENG set a little but before i realized they put me on a job and i was booming for a famous Dutch TV show (5 uurshow). With the ENG jobs i learned a lot about location recordings with a basic setup, just an audio-boom with a Senheisser MKH416 and a handmic, an ElectroVoice RE50. Sometimes a wireless solution, but i did not like that too much because of all the extra sounds you will get by air. To get a good result was sometimes not easy, but it is a fun job to do. Besides the ENG jobs my boss let me go with the EFP productions. The company Sonotech where i worked had 3 OB-vans at that time. First i did the gameshow "The price is right". There i met my friend and Audio-Guru Warner Groeneveld. This guy is till today my 'Guru for sound'. I learned a lot with him, like how to use a compressor/limiter in a live situation. But also how to control your cables on location and solve a lot of technical problem on the go :) After some weeks he put me at the mixing desk when we did rehearsing. I cannot explain how it felt, but i know it was one of those moments in life. Besides Warner also my other collueages Frank Mosch and Peter Westbroek teached me the things i needed and give me the chance to grow in Audio. Thank you guys !!! Besides the EFP stuff i worked also in the studio, as an audio-boom operator for several comedies and i also used my AKAI S950 sampler at some studio jobs, to do applause and live sound effects. Amazing times , Sonotech was the best school i could wish. Since that time i worked for a lot of TV and Webcast productions worldwide like all Dutch and Belgium broadcasters/TV stations but also Eurosport, BBC , Formula 1, NOS Studio Sports & News, FOX USA, ZDF Germany. Nowadays in Brazil i worked also for Globo and Band. Too much to remember all. This all did come together in a crossmedia company in which i run with Michiel Overeem for more than 10 years now. The basics of this company named Connecting Media is build on audio & music. We put a lot of time in Audio, Music & Sound-design for our video/game & mobile productions, and..... we still make music. 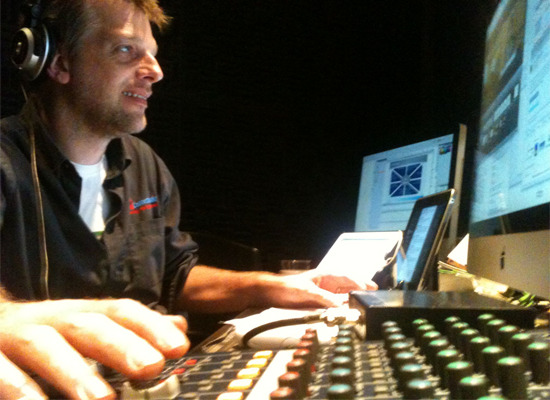 We have a little professional Audio Studio inside our office in Baarn. In Santos i am planning to build my room again. It is more easy to have a full blown setup with the computer power, plug-ins of expensive equipment available nowadays, but it still needs the brain to make something special. That's why i still love to make music, do sounddesign and freak on some new loops and sounds to make... hours and hours long. At the moment i use Logic and Reason for my music and remixing stuff. Also broadcast audio on location i still do. In Brazil i can perform this at the huge UFC live TV shows with another great engineer Daniel Littwin. And still i am learning every time i do a job. I am also working every year at the Formula 1 at Interlagos, São Paulo... great to work there with all top of the bill equipment. I made my love and passion for Audio, Remixing & SoundDesign into my job and that made me very proud and happy. nb: just started remixing again... an I MUST DO IT . Keep you all posted when i will have some results ready.